What is the history of PANDAS? What are risk factors for PANDAS? What are symptoms and signs of PANDAS? What type of doctors treat PANDAS? How do health care professionals diagnose PANDAS? What is the treatment for PANDAS? What are complications of PANDAS? What is the prognosis of PANDAS? Is it possible to prevent PANDAS? PANDAS is an acronym for "pediatric autoimmune neuropsychiatric disorders associated with streptococcal infections." It is a fairly recently described disorder (1990s). An autoimmune response to a streptococcal infection is the leading theory as to the cause of PANDAS. It is diagnosed if there is a history of abrupt development of a number of neuropsychiatric symptoms associated with a group A streptococcal (the type of bacteria causing strep throat) infection. Medication and cognitive behavioral therapy (CBT) are the primary treatments for PANDAS. PANDAS is an acronym that refers to "pediatric autoimmune neuropsychiatric disorders associated with streptococcal infections." It is diagnosed clinically after a patient develops a number of behavioral and physical symptoms following a streptococcal infection (for example, strep throat, sinusitis, cellulitis, or scarlet fever). PANDAS is a rare condition. It is believed that approximately one in 2,000 children are affected, though the diagnosis may be overlooked due to some of the common symptoms associated with the disease. In fact, there are some researchers who recommend categorizing PANDAS as a subset of other disorders, which includes similar neuropsychiatric symptoms called CANS (childhood acute neuropsychiatric symptoms) or PANS (pediatric acute-onset neuropsychiatric syndrome). PANDAS was described in the late 1990s after investigators identified a subgroup of children who developed a sudden onset of obsessive-compulsive disorder (OCD) symptoms, vocal and motor tics, and other behavioral changes. They identified that there was a common association in these children, and that was identified as a recent or active infection with a beta-hemolytic Streptococcus, the bacteria that causes strep throat. Researchers also identified a number of other infectious agents, known to cause significant auto-inflammatory reactions associated with neuropsychiatric symptoms, including influenza, varicella, and even Borrelia burgdorferi (Lyme disease), but the diagnosis of PANDAS is limited to streptococcal infections. What Are the Potential Complications of Strep Throat? Consensus opinion is that PANDAS is in part caused by an autoimmune response to a strep infection. Streptococcus is known to be associated with a number of immune-related disorders, including rheumatic fever, scarlet fever, and acute glomerulonephritis (a kidney disorder). The strep molecules are known to hide from the host immune system by mimicking host cells. Ultimately, the immune system recognizes the foreign cells, and the antibodies produced attack the bacterium, and unfortunately, some of the host's own cells are attacked as well due to cross-reactivity. In some situations, these antibodies attack brain cells, causing OCD, tics, and the other symptoms frequently observed in PANDAS patients. Multiple risk factors may play a role in the development of PANDAS, including recurrent group A streptococcal infections, family history of rheumatic fever, and the mother's history of having an autoimmune disease. PANDAS is also more common in boys and prepubertal children. PANDAS symptoms are similar to those of obsessive-compulsive disorder (OCD), attention deficit hyperactivity disorder (ADHD), and motor or verbal tics. Other symptoms include separation anxiety (the child has difficulty separating from the parent), mood changes, changes in handwriting, bedwetting or change in urinary frequency, and sleep disturbances. Symptoms tend to appear suddenly, and the recovery period is variable. Often the symptoms may worsen during streptococcal infections and improve in between. Most children will first be seen by their pediatrician when symptoms develop. Further management requires referral to a psychiatrist or other mental-health professional who can prescribe medication and provide cognitive behavioral therapy. Other physicians that may aid in the management of PANDAS include a pediatric neurologist or behavioral developmental specialist. As mentioned above, there are five criteria used to diagnose the disorder and must include the sudden onset of OCD, tics, ADHD, or a rapid worsening of existing symptoms. To make the diagnosis, one also needs evidence of a recent or active strep infection either by throat culture or by antibody testing for Streptococcus (for example, antistreptolysin O or antideoxyribonuclease B antibodies). A onetime measurement of antibodies is not sufficient for the diagnosis; these antibodies should be measured at two different times (four to six weeks apart) to detect a rise in levels. Along with the clinical diagnosis, it is important to be sure that there is not some other reason for the symptoms, and additional testing might be performed for that reason. In fact, distinguishing PANDAS from Tourette's syndrome (a common tic disorder), OCD, or Sydenham chorea (a movement disorder associated with rheumatic fever also caused by Streptococcus) is not always a simple task. First-line treatments for PANDAS include cognitive behavioral therapy (CBT) and medication, depending on the breadth and severity of symptoms. Currently, the primary medical therapy is focused on controlling the OCD symptoms, and therefore selective serotonin reuptake inhibitor (SSRI) medications are frequently used (fluoxetine [Prozac] and others). The other more acute measure in treating PANDAS is treating the strep infection associated with the symptoms. Antibiotics are the treatment of choice to eradicate an active strep throat infection. Your doctor may prescribe penicillin, amoxicillin (Amoxil), azithromycin (Zithromax), or another antibiotic. For severe and refractory symptoms, the use of other treatments aimed at controlling the immune response have been studied and found to be effective. These include the use of intravenous immunoglobulin, steroids, and plasmapheresis (plasma exchange therapy, in which blood is withdrawn from an individual and the liquid portion is removed and replaced and the blood is transfused back into the individual). For both treatments, the "offending" antibodies are removed. Steroids are less effective, because, although symptoms decrease during the treatment, they return soon after stopping the drug. More studies are needed to be able to recommend immune-modulating therapies without hesitation. PANDAS has not been associated with the development of heart issues as seen in children with rheumatic fever. Untreated or unrecognized PANDAS may increase the risk of having OCD and tic disorder into adulthood. Though some children completely recover from PANDAS, there are some who develop persistent neuropsychiatric symptoms or develop worsening symptoms after each strep infection. It is not currently possible to predict which children will be affected or how severely. The mainstay of therapy is to decrease the OCD, tics, or other behaviors that might interfere with daily life and school. For those children diagnosed with PANDAS, there is some evidence that prophylactic antibiotics may play a role in preventing the development of strep infections and therefore the worsening of symptoms. However, there are side effects associated with daily antibiotic treatment, including diarrhea and the development of antibiotic resistance. More studies need to be performed to be sure that the preventive treatment is truly effective. Surgical removal of the tonsils and adenoids has not shown to be effective in preventing PANDAS and is thus not recommended. Murphy, T., et al. "Pediatric Acute-Onset Neuropsychiatric Syndrome." Psychiatric Clinics of North America 37 (2014): 353-374. Singer, H., et al. "Moving from PANDAS to CANS." Journal of Pediatrics 160.5 May 2012: 725-731. Swedo, S.E., et al. "From research subgroup to clinical syndrome: Modifying the PANDAS criteria to describe PANS." Pediatric & Therapeutics 2.2 (2012). Is mono contagious? What is mononucleosis? Learn about mono symptoms, treatment, and diagnosis. 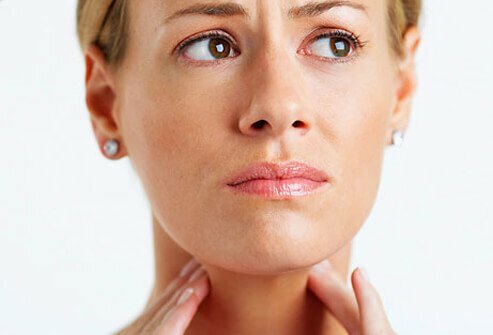 Discover how mononucleosis is caused by the Epstein Barr virus. What treatment was effective for your child's PANDAS? Please describe your child's PANDAS symptoms and signs. Amoxicillin (Amoxil, Moxatag, Larotid) is an antibiotic that belongs to a class of antibiotics called penicillins. Common infections that amoxicillin is used to treat include middle ear infections, tonsillitis, laryngitis, bronchitis, pneumonia, skin, gonorrhea, and urinary tract infections. Common side effects of amoxicillin include nausea, itching, vomiting, confusion, abdominal pain, and easy bruising. Drug interactions, dosing, storage, and pregnancy and breastfeeding safety should be reviewed prior to taking penicillins. Dispermox, Trimox, Wymox, Utimox, and Polymox are discontinued brands and are no longer available in the US. Attention deficit hyperactivity disorder (ADHD) in teens is a disruption of neurocognitive functioning. Genetics contribute to ADHD. Symptoms of ADHD in teens include inattention, hyperactivity/impulsivity, or a combination of these. Treatment may include cognitive behavioral therapy, behavior therapy, medication, or alternative therapies. Fluoxetine (Prozac, Sarafem, Prozac Weekly) is a drug prescribed for the treatemnt of depression, bulimia, obsessive-compulsive disorder (OCD), panic disorder, and premenstrual dysphoric disorder (PMDD). It is also prescribed in combination with olanzapine (Zyprexa) to treat resistant depression and depression associated with bipolar disorder. Side effects, multiple drug interactions, dosage, and pregnancy safety should be reviewed prior to taking this medication. Keflex (cephalexin) and penicillin are antibiotics used to treat a variety of bacterial infections. Keflex and penicillin are in different drug classes. Keflex is a cephalosporin antibiotic, and penicillin is a penicillin-type antibiotic. Examples of penicillin antibiotics, side effects, drug interactions, and pregnancy and breastfeeding safety information should be reviewed prior to taking any medication.